Like any girl - big or small - Bridie has plans to be a ballerina/princess when she grows up. I think the ballerina bit might be her day job - she is still working on the details - not least of all the prince - 'but where will I find my prince?' she asked me. Ah, that age old question. 'You'll just have to keep looking' was my helpful reply. Sometimes she branches out into fairyland. As long as she can picture herself in some kind of frilly fancy fairy/princess/ballerina outfit, she is a happy girl. 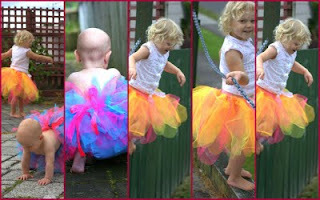 So of course I couldn't resist ordering Bridie her very own Bouncing Blossom Tutu for Christmas. Susie had it sewn in a flash, and ready to post out (keep an eye out Nan). Talk about awesome service! I chose the 'hydrangea' for Miss Bridie, but they are available in a range of colour combinations - either chose from one of Susie's blossoms, or design your own colour combo for a one of a kind tutu. Don't they look pretty? These gorgeous girls belong to Susie and Matt - Oceana and Bridie used to go to Playcentre and Mainly Music together in Waihi Beach. We haven't had the pleasure of meeting sweet baby Naomi in person but she is reminding me a lot of when we first met the Sams girls - and teeny little Oce was walking already! Walking! Already! (about nine months old early). Whew! In amongst chasing babies Susie has just launched Bouncing Blossom Tutus and is taking orders now (and if you get in quick you should have it for Christmas). Please head over to her blog for all the details of colours, sizes, prices etc. I know she is happy posting out NZ and USA orders (the tutus are light, so it only costs a few dollars to post) and if you are somewhere else I am sure she will happily send to you too (okay, check with Susie on that, but I am sure it won't be a prob, if you are happy to pay the postage). I expect to have lots of photos of a VERY happy Bridie blossom from Christmas day, so I will be sure to share that smiley face!